It’s been about two weeks since the alleged hate crime against “Empire” star Jussie Smollett, and it doesn’t feel like we’re much closer to understanding exactly what happened. 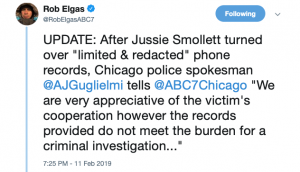 And it seems we can thank Smollett himself for that. The records for the phone he initially refused to turn over, that is.